More about the expectations in 1994 can be read in this archived article. 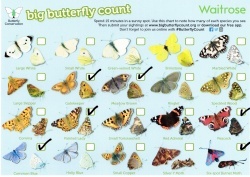 Professor Colin Smith was the first to carry out regular surveys of the butterfly population (see panel, right). Survey work was done again between 2008 and 2012 by Doug and Jenny Taylor, using the formal “Transect Method”: a common method for monitoring, where the same area of land is walked regularly, at a constant pace, counting what’s seen within a 5m visual square. 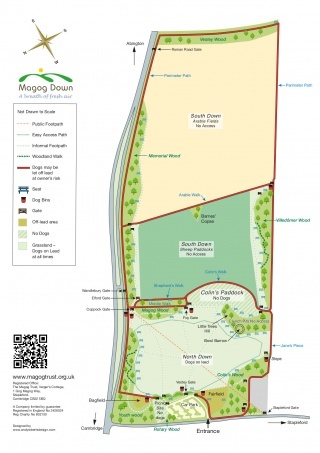 Then in 2015 a Friend of Magog Down called Barbara Massingham-Stubbs took up the challenge to resurrect the Butterfly Transects that Doug and Jenny had started. Details about the methodology used are in this news article. Results of the surveys show that by far the most common butterfly seen now is the Meadow Brown (shown in the table above, second one down), making up just over half of the individuals counted. 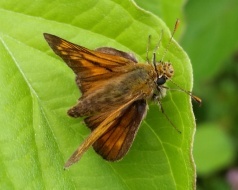 Others seen in large numbers are the Essex or Small Skipper (bottom image in the table above), the Small White, and the Common Blue. Comparing Barbara's 2015 and 2016 data, one noticeable increase so far is in numbers of Marbled White (left) and Large Skipper (below). A grand total of 1605 butterflies from 22 different species were recorded in 2016. We look forward to seeing the results of Barbara's ongoing monitoring in 2017 and beyond. 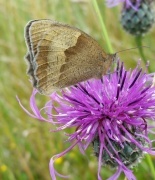 Magog Down is a great place to spot butterflies as part of this nationwide survey. Two of our Governors were meeting another person in the first week of the count, and their list of "spots" is shown below. Do enjoy your own spotting exercises, and we're always interested to hear about your visits. Professor Colin Smith was a keen lepidopterist who took a great interest in the Down. 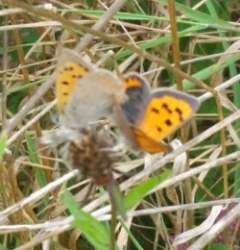 He was convinced that the increase in the natural flora would provide the necessary food supply to encourage a further growth in the number of Butterfly and Moth species on the Down. He regularly contributed articles to the Trust's Newsletter and carried out surveys over several years, and by the end of 1995 had recorded 20 species of Butterflies and 152 of Moths. His death in 1997 is marked by a seat on the North Down, but two years later this site was identified by Dr Max Walters and Gerry Haggett, a Norfolk Naturalist, as one which if cleared of trees and shrubs, would produce an ideal sunny, sheltered bank on which to improve the variety of native chalkland flora. The initial work was carried out in 2000 with financial support from Colin s family. 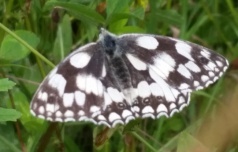 Further work to improve the diversity of the natural flora providing an increased food supply for Butterflies, Moths and other insects took place in 2004 and was part funded by an Environmental Grant from Cambridge City Council. Numbers may be declining overall but here are two species that were caught in the act! 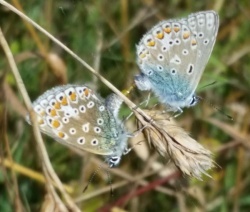 The Common Blue and the Copper have both been spotted mating by Barbara Massingham-Stubbs on her butterfly monitoring - she looks forward to counting their progeny in future years.